Marie is 14 years old and she doesn’t know if or when she’ll go to school again. Every day she collects water, cooks, picks nuts to sell, then visits her sick mum. How long can she go on being this hungry, this tired… what choice does she have? In places like the Democratic Republic of Congo, children just like Marie, are falling prey to child exploitation - on the promise of a meal a day. But we believe Marie was made for more. Growing up without choice: recruited to fight in armed groups or forced to marry soldiers or made to work in perilous conditions, tonight another child could face the reality of modern slavery. But a gift of £10 could feed two children for a month in the DRC. This is your chance to join others, like you, who care. To help children become everything they were made to be. Children like Marie don’t have time to wait – they need another choice today. With your help, we can protect them from a life of violence and despair. overcome poverty - thanks to the work of World Vision with communities and families. We’ve specialised in transforming the lives of children in the most vulnerable of communities across the world for nearly 70 years. And we know that when we work together, we can protect children. Help us strengthen communities and families by supporting education, family incomes and communities to ensure the safety and bright futures of children. 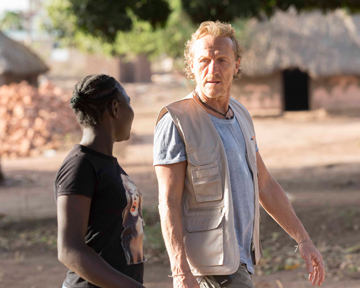 Game of Thrones actor, Jerome Flynn, recently saw first-hand how World Vision is helping children in South Sudan, through rehabilitation, counselling and food distribution. They've already experienced awful abuse - but children, like Marie, don't have to.